When Melanie Ross is sacked from her job as a governess in Ohio, she decides to take the most appealing option available. She will move to Arizona to collect the belongings of her only relative, deceased cousin George Ross. Maybe her cousin’s friend, Alvin Nelson, will have work for her in the Cedar Ridge Mercantile that he and George owned. However, when she arrives in Cedar Ridge, she discovers that Alvin has died too. Now his nephew Caleb Nelson, who claims to have inherited the store, feels quite capable of running it by himself, thank you very much! But Melanie won’t be disposed of easily. She is sure that George meant for her to inherit his share of the business. With experience in shop-keeping and entrepreneurial instinct she is soon making changes in the Cedar Ridge Mercantile that bring in customers, even though Caleb tries more than one ploy to get rid of her. A string of unwelcome marriage proposals for Melanie along with threatening notes, a dead body on the doorstep, rumors and suspicion concerning the Mercantile and its past and present owners kept me turning pages of this Carol Cox-authored novel even though some of the plot elements didn’t seem realistic. For example, why don’t Caleb and Melanie make more of the threatening notes found in the store? Instead of telling the marshal, they just destroy them. And why don’t they report a mysterious nighttime Mercantile intruder instead of shoving the incident aside as if it hasn’t happened? Main character Melanie is a feisty, positive, warm though somewhat short-tempered heroine whose courage in the face of a lonely life won my sympathy. Perhaps predictably, widower Caleb and his small son Levi grow increasingly more likeable as the story progresses. I only wish Melanie had shown more warmth toward little Levi. She is quite critical of him, mostly correcting, nudging, and giving him looks—but then, she is a former governess. Both main characters have a Christian faith. This faith anchors and guides them through hard times and pervades the book, though subtly. “Beyond the edge of town lay a vast landscape dotted with the sprawling cedars that must have given the town its name. Farther out, a line of trees bearing darker foliage meandered o(ff ) in an undulating line. And behind those trees hung a backdrop of tawny hills. Some of the pale brown slopes were adorned with more cedars, while others, streaked with pinkish layers, rose up in sheer cli(ff)s surmounted by a ridge of barren rocks. The e(ff)ect was absolutely breathtaking” – Kindle Location 859 (brackets indicate the missing ‘f’s in my review copy Kindle edition). All in all, Trouble In Store is an entertaining Americana historical with elements of the wild west, mystery, suspense, romance and even a little slapstick—a good choice for a light summer diversion. I got this book as a gift from publisher Bethany House for the purpose of writing a review. However, the NetGalley ebook version I received was full of typos. It seemed every ‘ff’ and often adjoining letters were missing from words. This led to a lot of guess-work and a bumpy reading experience. 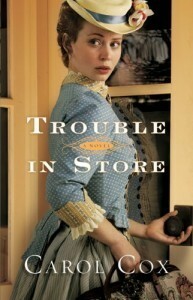 Sign into Goodreads to see if any of your friends have read Trouble in Store.